Email is the go-to technology in the world today. Everyone has adopted it, and everyone uses it as their de facto communication standard. Being it’s so ubiquitous, email can be over used and to many professionals today overwhelming. That is why I adopted the David Allen “Getting Things Done“ model to my email. The second best thing I ever did for email (the first, coincidentally is switching to Gmail) was to create a label telling reminding me that I need to do something for that email. Even something as simple as needing to read the email in detail later can save you when you are plowing through 20+ emails in 30 seconds. 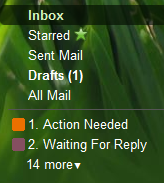 Quickly labeling something with “Action Needed” allows you to keep your inbox empty but still remember that the email still needs your attention. This is the hardest step of the process, but it will save you time and time again. When you send off an email and are explicitly waiting for a reply be sure to label it with “Waiting for Reply”. While this process will help you get YOUR email in order, many other people out there will forget to reply to you (don’t worry, your “Action Needed” flag will prevent you from doing the same!). This label is a great tool to help remind you of who you are waiting on, and whether you should nudge them to reply back to you. Also, don’t forget to remove the “Waiting for Reply” label when the person actually replies to you! Multiple inboxes is a Google labs feature that helps you put multiple inoboxes on your Gmail home page. Why would you want multiple inboxes you ask? Simple, with this system you can create an “Inbox” for your labels! 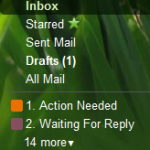 That way on your Gmail home screen you have your regular inbox, an inbox with emails labeled “Action Needed” and finally an inbox for emails labeled “Waiting for Reply”. This way you can archive the email from your regular inbox, but still see prominently on your Gmail home screen emails requiring some action or ones you are waiting for a reply to. To enable multiple inboxes go to Settings ->Labs and enable Multiple Inboxes. You now should have a “Multiple Inboxes” tab in your settings. There just set Pane 0 to “label: Action Needed” and Pane 1 to “label: Waiting For Reply”. Now you have your GTD labels on your Gmail homepage as special inboxes! When someone sends you an email that requires you to eventually do something, use the Gmail “Move To” button to quickly move that email to the “Action Needed” label. The Move To button in Gmail allows you to quickly move emails from one label to another. And there you go! Some simple rules and procedures to help keep your email in order. If you have a different system (or one similar) let me know in the comments! If you find a way be sure to post it! I’m currently exploring a process for handling my email. I just nuked my inbox. Sorted everything into either archive, on my tasks list, or trash. I think this label system is something I could utilize. Great post! The “Waiting on Reply” label is brilliant. Personally, though… I don’t even try to prevent things from slipping through the cracks. I do my best to keep track of things. And if things get lost along the way? Well, if they’re important, they’ll resurface on their own. Thanks for this! Never knew about the multiple inboxes and have never really used the archive system… just spent 15 minutes setting it up, and getting my inbox to zero, with only 31 “action needed” and 1 “waiting on reply” … a lot less stressful to look at than the thousands of emails that were in my inbox. Thanks! Next Post: New Project Launched: AgileTask!